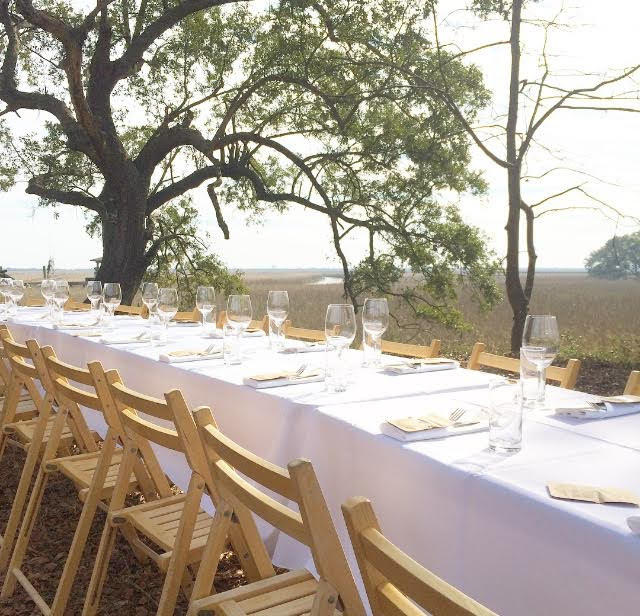 Imagine a beautiful long table stretching for miles, set with white linens and perfectly placed menus, sitting in the middle of a working farm, surrounded by water and scenes of the lowcountry. Are you with me?! I had the pleasure of attending an unforgettable dinner a few weekends ago, one that left me wishing ever Sunday supper looked like this. Outstanding in the Field is more than just dinner, it's an experience. Upon arrival, we were welcomed to the farm with cocktails and passed hors d'oeuvres, in which we enjoyed while we toured the farm. I must get my hands on the pickled deviled egg recipe, they were so good! We also enjoyed some sweet potato-goat cheese gougères, which were equally as delicious. 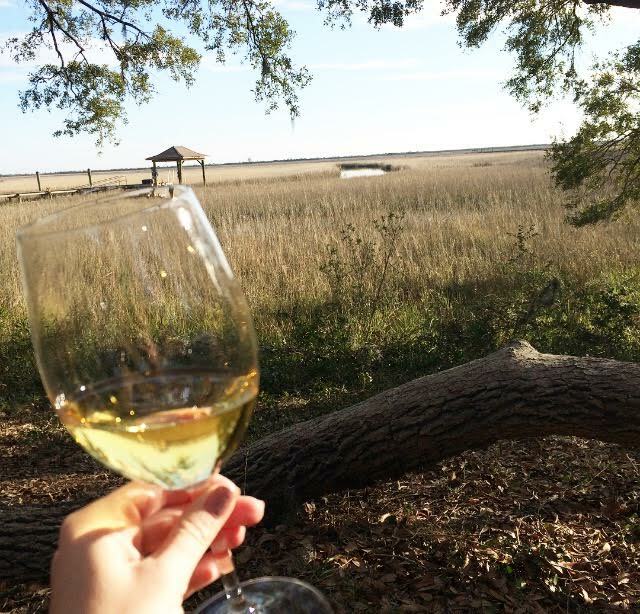 After about an hour into the reception, we were introduced to those that work behind the scenes of these beautiful events, along with the folks that bring Bulls Bay Saltworks to life. Bulls Bay is a local company that hand harvests salt to produce an exclusive line of products that can be found from coast to coast and in many fine restaurants in the south. You may be wondering how all of this ties together. The farm where we had dinner was located just off of Bulls Bay, where the salt is harvested. It was such a pleasure to learn about the process and what happens to those pretty little crystals of salt before they reach your plate. After our welcome discussion, we picked up a plate and were escorted to the table where we chose a seat. The plate situation is unique because you may bring your own, or you may opt to use one of theirs. The assortment of different plates creates quite a beautiful display on the table. Once we selected our seats at the table, we enjoyed a family style meal prepared in an outdoor kitchen by guest chef Chelsey Conrad of Butcher and Bee. The Anson Mills 'rouge de Bourdeaux' challah served a dual purpose. as both the table decor and the starter to our meal. It was served with benne tahini, Lowcountry Creamery butter and Bulls Bay Saltworks smoked sea salt. There was also a trio of other dips that everyone immediately dove into before there was time to snap a photo. The first course was a cabbage salad with olive relish, almonds, date chili and pomegrante molasses. It was crunch, light and refreshing— all things that a salad should be. Next up was a heaping bowl of freekeh porridge with smoked Keegan-Filion Farm chicken, preserved lemons and almonds. This was such a comforting and hearty dish. It reminded me of a sophisticated version of chicken perlo (minus the sausage.) I couldn't resists getting a second serving of this. Colorful Lowland Farm veggies were served for a perfect healthy balance. The Keegan Farm chicken shawarma, beef belly, and ground lamb was served hot off the grill, kabob style. It was the final bit of protein that pulled the meal all together, leaving just barley enough room for dessert. No one could say not to this beautiful babka tart with black pepper-mascarpone cream that was almost too pretty to eat. Flaky dough with layers of chocolate and fresh strawberries was the perfect way to end the perfect meal. We had such a great time meeting new friends at the table while enjoying Chef Conrad's delicious food and sipping on great wine. I would jump at the opportunity to attend another one of these events. Check the Outstanding in the Field website for a list of places they will be popping up. I highly recommend reserving a seat at their table if they come to a city near you! Wow, what a feast! I definitely need to check if they'll be coming to a city near me. I've always wanted to attend one of these! This is absolutely amazing ♥ I wish that every Sunday for me looked like this too! I would attend something like this in a heartbeat given the chance.